The engineering team at Dexter uses a variety of software tools to effectively model, design and produce magnetic components and assemblies. Initial design concepts are further developed using SolidWorks, the industry’s leading 3D solid modeling software tool. With this software we can produce complex parts and assemblies and associated drawings very efficiently. SolidWorks integrates well with Lorentz, our primary 3D magnetic modeling software that can be used in either finite or boundary element analysis [FEA / BEA] mode to produce modeled results. Our engineers can use Lorentz in parametric mode, to automatically run multiple iterations of magnetic models efficiently. 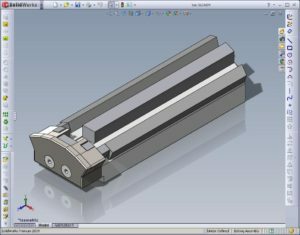 Optimized model designs can then be imported into Solidworks for the creation of engineering drawings. 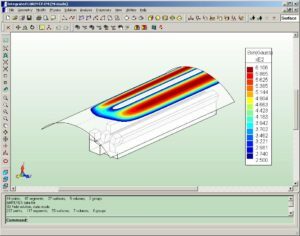 Our engineers also use Ansys, a powerful multi-physics FEA modeling tool, as well as Magneto, a 2D / rotational symmetric magnetostatic modeling tool and Oersted, for modeling losses due to eddy currents. We also use a variety of other, proprietary software tools to aid in our design process. Underlying the use of all of our tools is a solid, fundamental understanding of magnetostatics and general magnetic circuit design and analysis.